Hello and welcome to the 71st installment of the SWD. 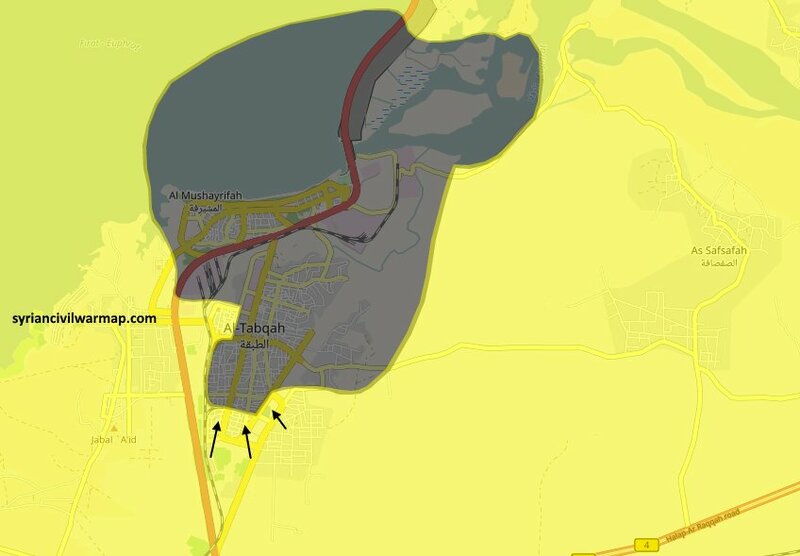 SDF made big advances in Tabqa against IS as it appears that the latter’s defenses in the city crumbled under former’s pressure. Area captured inside the city from the western side includes parts of Industrial Facility and area around mosque. From the south whole Al-Wahab neighborhood was captured by SDF. Footage released showed at least four IS fighters captured in Tabqa. 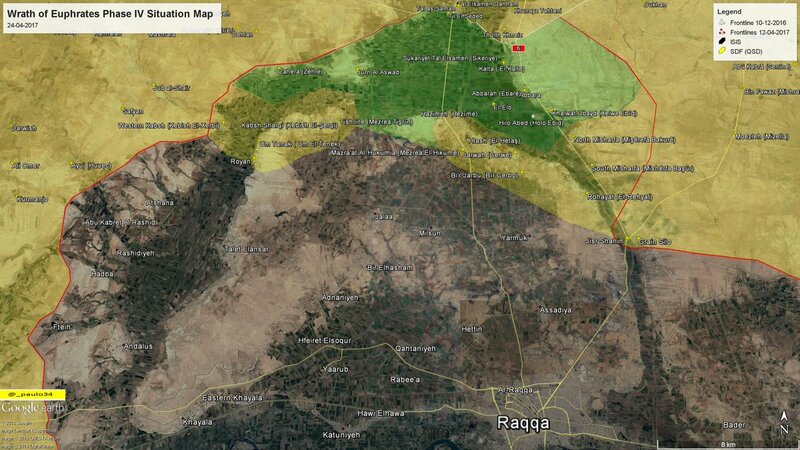 As expected yesterday’s IS attack north of Raqqa was a distraction for IS fighters to retreat from the area SDF was about to encircle as the complete area came under SDF‘s control. 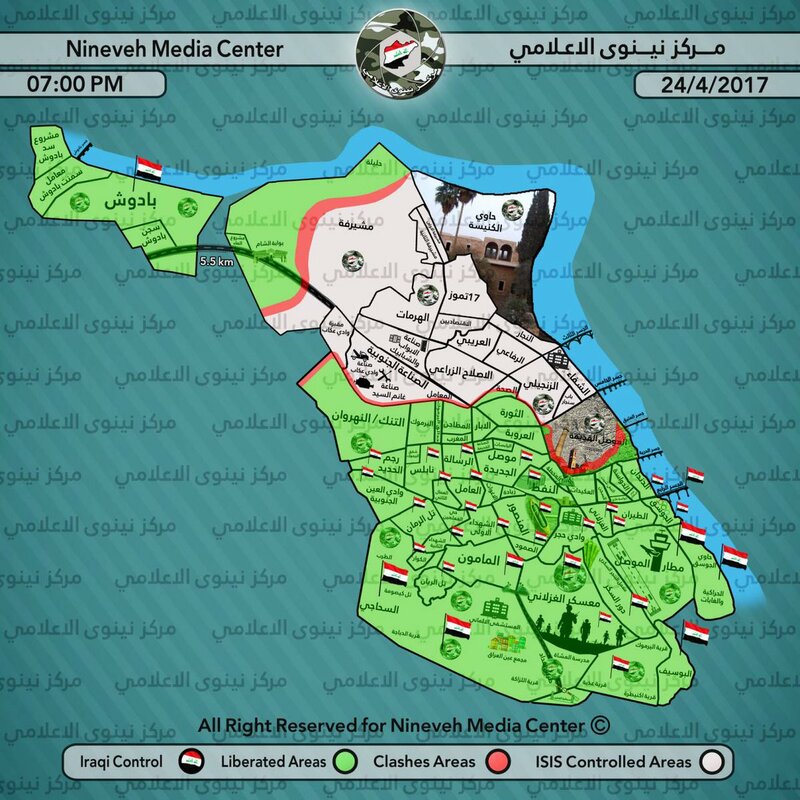 Some of the captured localities include: Khalwat Ubayd, Hilo Abed, Abbarah, Al-Kalte, Jurn al-Aswad and Zahera. SAA made a new, fresh set of advances in northern Hama reportedly capturing Masasnah, Zawr al-Teba, Zawr Mahruqa, Jabal al-Shir and Zalin checkpoint. However, some of these advances such as Zalin are being disputed by pro-rebel sources which claim SAA retreated from it after taking heavy casualties. Jaysh al-Izzah did release footage showing them targeting SAA infantry near Zalin with TOW missiles. First strike targeted a small group and by the looks of it only did small damage mainly because TOWs were designed as anti-tank and not anti-infantry weapon. However, the second strike did more damage despite TOW not being anti-infantry weapon, larger group of SAA soldiers was targeted and at least a couple of them were killed. Village of Al-Zilaqiat is still contested as it looks like rebels repelled second attack by SAA on it. Rebels even launched two TOW missiles in Halfaya area probably around Al-Zilaqiat reportedly destroying a 23 mm gun, footage of the second TOW strike showed rebels targeting a T-72 but no significant damage was inflicted to the tank. Besides increased amount of ATGM strikes rebels started using artillery more often, around Halfaya Jaysh al-Nasr claimed SAA tank was destroyed by artillery and around Tayyibat al-Imam again Jaysh al-Nasr claimed a hit on SAA infantry in one of the buildings inside the city. The last rebel claim of destruction comes from Jaysh al-Izzah which claimed that their tank destroyed SAA‘s ZSU-23-4 (Shilka) west of Tayyibat al-Imam. Take these claims with a grain of salt as there is no footage to prove that any of these destruction claims really occurred. Increased rebel usage of ATGMs as of lately could indicate that they received a new batch of ATGM missiles probably from Turkey, however, this may be false and rebels could have a bigger stock of missiles than what was it estimated at. Sixth batch of rebels and civilians left Al-Waer district, Homs towards TFSA-held Jarablus, reports suggest that around 1200 civilians and 160 rebels left the district. Rebels from Northern Homs pocket launched a night raid southwest of pocket against SAA, it is possible that this raid was conducted by Hayaat Tahrir al-Sham’s inghimasi (suicide fighters) that pulled off a similar raid on 17th of April in Al-Salamiyah area. To be sure who was behind this it is best to wait until footage of ghanima (spoils of war) is released as there were reports that rebels seized a T-55 tank and 37 mm gun. Attack was concentrated on checkpoints in Al-Qabu and Al-Qinaqiyah area and after both sides suffered heavy casualties rebels were pushed back. 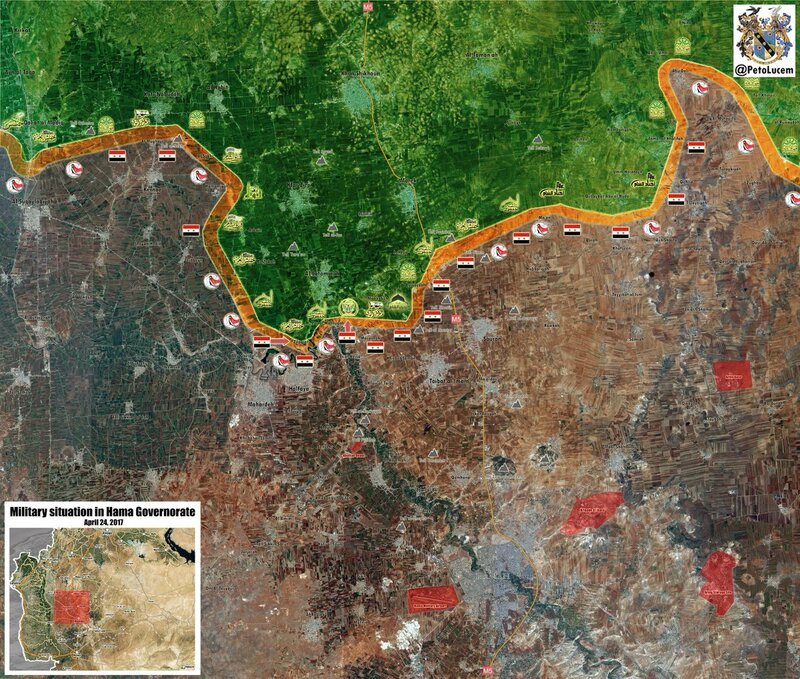 Before being pushed back rebels captured Al-Assia and Al-Fela checkpoints. SAA captured several heights/peaks from IS near Shaer and killed at least five IS fighters. Captured heights/peaks are 969,7,1108,1132 and 1062. According to the pro-rebel sources SAA attacked Jaysh Usud al-Sharqiya’s positions in eastern Al-Suwayda governorate. Jaysh Usud al-Sharqiya captured this area from IS on 27th of March after the latter retreated from it. Al-Hashd al-Shaabi (Popular Mobilization Units) repelled an IS attack north of Baiji, Salah al-Deen, attack consisted of at least four suicide bombers which were reportedly neutralized. This is just one of the desperate IS attacks to open a route between Hawijah pocket and Iraqi desert for IS leadership to escape from the pocket before Iraqi Army launches an offensive on it. Two more attacks launched by IS yesterday were also repelled by Al-Hashd al-Shaabi, one attack was in Nineveh governorate southwest of Tal Afar on Qasr Mahrab village where IS suffered heavy casualties and lost at least four vehicles. The other attack was in Anbar governorate on the eastern part of Rutba, this attack was repelled by Iraqi Army and Al-Hashd al-Shaabi. Last night Iraqi intelligence arrested two IS suicide bombers in Al-Aamiriya neighborhood, Al-Mansour district, west Baghdad. Attackers were planning attacks against civilians, most likely against pilgrims currently in Baghdad. On the 23rd of April 2017 CJTF-OIR has conducted 24 strikes in Syria. CJTF-OIR‘s main focus in Syria at the moment is Tabqa-Raqqa-Deir al-Zour region where they did 22 strikes supporting SDF‘s operation against IS destroying 15 oil stills, five ISIS well heads, 24 ISIS oil facility assets, six fighting positions and two roadside bombs. Other area where two strikes occurred is Abu Kamal and Al-Shadaddi destroying three IS well heads. Full report on CJTF-OIR strikes conducted in both Syria & Iraq can be found here.